Available on 180g coloured (Kelly Green) vinyl. For over a decade Brooklyn's A Place To Bury Strangers have been dealing in pure sonic destruction. Famously lauded as the loudest band in NYC, their thunderous noise-rock has seen them pick up a cult following and shatter many unsuspecting eardrums across the globe. Raw, punishing and unpredictable, the LP - recorded live in one take - perfectly captures the APTBS ethos through-and-through and sees the unwavering intensity of their live show committed to wax like never before. "It's good to record at the very end of the tour," reflects Oliver Ackermann, the band's vocalist/guitarist and founding member: "You've been playing these songs all tour and there's a certain point when you kind of get tired of them so you have to reinvent what they mean and what happens in them. I feel like that always pushes things to the next level. It's exciting." Some songs on the session may date back a decade but, true to the APTBS way, they're totally reconfigured and pushed to their very limits. Spanning their lengthy back- catalogue, there are two tracks from Pinned ('Never Coming Back' and `Punch Back'), one from 2015's Transfixiation ('We've Come So Far'), one from 2012's Onwards To The Wall ('Drill It Up'), another from their 2007 S/T album ('Ocean') and a previously unreleased track ('Chrome Shadow'). What makes this LP stand out is the way in which the live setting perfectly captures the band's ability to work as a collaborative unit; every member feeding off one another, their tight-knit playing hardened by months on the road. Ackermann's visceral guitars and FX pedal manipulations may be what defines the APTBS sound but just as integral on this LP is Dion Lunadon's scuzzy, remorseless basslines and the primal percussion and snarling vocals of Lia Simone Braswell, who joined the band just last year. 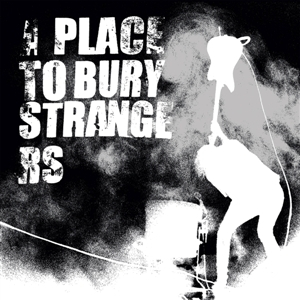 A Place To Bury Strangers - Onwards to the Wall ep.